One of the things I get asked about most is my cleaning schedule and regimen. I love having a clean home, and not just once a week, but every day. I can manage the rest of my life so much better when my house is clean and organized, and there’s something about an orderly home that provides a more calming atmosphere. Everyone is just happier in a clean home, especially me! Over the years as we’ve added more children to our family, it’s be come even more essential, because there are so many more people contributing to the mess and chaos. Years ago, I developed a routine that has worked wonders for me, and I’ve loved it ever since. I’m going to share my secret with you today! It works, and if you follow it, you WILL have a clean house. It all boils down to just one little word. MAINTENANCE. I’m a big believer in “maintaining” a clean house. It actually will take you less time overall if you do some every day, instead of saving it up for one big day or weekend. For example, it takes me less than 20 minutes to deep clean three bathrooms, because I do a quick 3 minute wipe-down of those bathrooms on a daily basis. The same applies for every section of your house. What do I actually DO, and how does it work? There are certain things that I do every. single. day. and these daily tasks are the key to to the whole maintenance process. I also have weekly and monthly tasks that I work into my daily schedule, and I can do all of that in about an hour or so a day, PLUS my folding laundry time in the evening. (I have about a 4000 square foot home, so that time will probably differ a little depending on the size of your house.) There are days where it takes a little longer than an hour, and other days where it doesn’t. I will switch things around depending on my schedule, and if there’s a day where I’ll be home all day, and other days I’ll be gone or busy a lot, I’ll put more on that one day. Some of the tasks I do all at once, and others are fit in throughout the day as I go about my routine. Daily tasks are at the crux of your success…they make everything else so much easier, and really make your home look and feel clean! These are the things I do every single day! * 3 minute wipe down of each bathroom (glass, counters, toilet, floor around toilet)I keep Clorox wipes under the cabinet, and when I’m finished getting ready, I quickly wipe everything down. I make my way to the other bathrooms and the same thing. * Make all beds: It’s the first thing I do in the morning, and I require all of my kids to make their beds before leaving for school. My little ones need help, but this is one of their very first chores. It makes a TON of difference in the way your home looks and feels. *Sweep after each meal: It only takes a minute–literally, I timed it! It’s amazing what adds up on the floor during the day, but if you’ll take the minute or two to sweep after each meal, it’ll be a breeze to keep up! *Wipe down the kitchen counters after each meal: The kitchen is the heart of the home, and when it’s a mess, it feels like the whole house is a mess. Wiping down the counters after each meal eliminates the crumbs, plus clutter that can add up during the day. *Keep up on the dishes: I load my dishwasher immediately after using any dishes…in fact, it’s a rule that no dishes can stay in the sink! You have to do it at some point, and it’s way faster to do a few at a time, rather than a bunch of them later. Load the dishwasher throughout the day, run it at night, and put them away in the morning! *Open all mail, go through school papers, and file! Oh, how paper can quickly take over our lives! Staying on top of it is the key, so each day go through mail and school papers and file them where they go. Controlling paper clutter will make a HUGE difference in both appearance, and as a time saver…since you won’t have to look for anything! I have a mini command center on my kitchen counter that makes it really easy–I have files for every child, bills, coupons, school papers, etc.–so I can quickly and efficiently get them off of the counter in an organized way. *Vacuum main living area: I vacuum our family room every night, or at some point during the day. It’s the main room of our home, and we all spend a lot of time there. It takes just a minute, but oh my goodness, it makes a huge difference! *Laundry: I personally prefer to do laundry every day. I do a lot of loads every week, and when you add in towels and sheets, it’s at least 15 loads. There’s no way I’m doing that all in one day! I wash and dry during the day, and stack the clean laundry in baskets in my room. Each night I fold the laundry, put it back in the basket folded, then put it away in the morning. It breaks up my time, doesn’t make it seem as overwhelming, and I can stay on top of it much more easily. *Entire house pick-up: I’m constantly picking up during the day, and having my kids pick up after themselves. I have baskets on the stairs for items that need to go up, and places for everything to go. The house gets picked up every night–there is nothing better than waking up to nice, clean house! Each night right before dinner, my kids help quickly pick up the house–they each have a buddy, and that team is assigned a different area of the house to tidy it up (family room, playroom, reading room). House rules also call for rooms to be clean before dinner. It works wonders, and not only does the house get cleaned, but it teaches them about being responsible for their messes and the work that’s necessary to maintain a home. It sounds like a lot, but when you do it every day, it really doesn’t take long at all! Where the daily tasks help control clutter, and maintain general cleanliness, the weekly tasks are at the core of a really clean home. These tasks will tackle the dirt and grime, and make your home truly clean. Work them into your daily tasks where they make sense–when you’re wiping down kitchen counters, go ahead and wipe down the cabinets. Instead of your 3 minute bathroom wipe down, deep clean the bathrooms. For your laundry one day, make it towels and sheets. Some of the weekly items, I admit, I do more often than once a week. I usually mop at least three times a week, sometimes more–I really can’t stand my kitchen tile, and it shows dirt and smears so quickly! I also vacuum more than once a week, but that’s because I’m kind of crazy when it comes to those lovely vacuum lines. ☺ I don’t think you have to–that’s just how I roll. The monthly tasks are even more of a deep clean, but if you do them every month, they don’t take nearly as long. I divide the monthly tasks into four sections, and then try to add those to my weekly tasks over four weeks. Some of these are great jobs for kids to help with–cleaning out garbage cans, washing down switch plates and doors, washing baseboards (my kids’ love this!) I will say that this is MY GOAL. Some of them are easier, and don’t take much time, like dusting the ceiling fans. I’ve only ever had a few fans, so less than 10 minutes, and they’re done. I also have a self-cleaning oven, so I’m not scrubbing it out like I used to, so it doesn’t take as long. If I don’t get them all in one month, I’ll try for two months. Things happen, and life happens, but I know that if I wait too long, it will be so much harder, and take so much longer, so that’s my motivation to try and stay on top of it as much as possible. This is just an example–it can be moved and switched around to fit your own daily schedule, and what makes sense for you. This is a typical schedule for me, but I also move things around if I know I’m going to be home one day (with more time), or busy/gone other days. As far as the time of day goes, it’s totally personal, as to when it fits into your schedule. For me, the morning works best. As soon as my girls and Ryan are off to school, I settle my boys with some puzzles or a game, set my baby to play in her walker where she can see me, and I go to work! I make the rounds of the house–checking beds, wiping down bathrooms, and general straightening, which is about 10 minutes total. Then I tackle my list items for the day…I can get my floors (sweeping and mopping) done in about 30-45 minutes . If I have more time, and the baby is still happy, then I’ll squeeze in one more item from my list. If not, I’ll wait until nap time or another time during the day. I also get stuff done after my kids go to bed, because that’s when the house is quiet, and I can do it uninterrupted. During the course of the day, I’m sticking to my daily tasks–wiping off counters, keeping up dishes, and sweeping after each meal. I’m a HUGE multi-tasker, and while my boys are eating their lunch, I can talk to them while I’m rinsing dishes, cleaning the oven, or wiping down the inside of the fridge. I would be in the kitchen anyway, and this lets me get more than one thing done at once. I apply this concept very often during the day. General pick-up happens a couple of times during the day. If my boys are getting too crazy with toys, then we’ll stop and put a few away, so we don’t have so many later to clean up. I check the mail and sort it in the afternoon, and try to have that done before kids come home from school. Once kids are home, I usually don’t have time for anything on the list–it’s time for homework, piano, ballet, sports, etc., and I’m either in the car or busy helping a child. I do require all backpacks to be cleaned out (and papers brought to me) and hung up as soon as kids come in the door, and shoes in the basket. No snack until it’s done! I’m really strict on this, because it’s one way the house can get crazy…fast! I do go through their school papers as I’m helping them with homework, which has worked really well for me. Right before dinner it’s time for our stations, and everyone quickly gets the house straightened. After dinner we clean up the kitchen together, and it’s family time until kids are ready for bed. Once they’re settled, I vacuum the family room if I haven’t had time that day, and then I sit down with a basket of laundry or two while I watch a movie or favorite show. I can fold three baskets of laundry in about 30 minutes, so I still have plenty of time for other projects, reading, or relaxing. I do have to add, lest anyone thing that there is never a speck of dirt in my house, that it isn’t always perfect. I do have six kids and a husband, and we do live in our house. Like everyone, there are lots of crazy moments–when the kids have their homework out, they’re practicing the piano, while I’m making dinner, and we’re dashing out the door to violin or soccer. I have days where my kids are sick, or I’ve had an extra busy day It’s LIFE! But I do make a concerted effort to keep everything straightened, picked up, and clean, because that’s how I function best–our family does better, I do better. So…if you’re ready to take this on, I know you can do it!! You will need to start with a clean house in order to maintain it, but you can use all of the checklist items to get to that point, and then you’re ready! Clean your house for YOU, not for just company–you and your family live there, and will get to reap the benefits on a regular basis of having clean home. This has been so interesting!! I’ve gotten e-mails and comments that are wonderful, and others that accuse me of not having six kids, lol. It’s true, I do! I’ve had lots of comments from working moms, and I really want to address that. I know we’re all in different circumstances–different lives, different schedules, different families. We all work hard, but some outside the home, and others are home with their kids. My hat is off TO ALL MOMS, whether you work in or out of the home, we’re all in this together. We all work hard, we all have a lot on our plate, and we’re all trying to do the best we can. I am a SAHM, but I also work from home. I’m trying to fit in a job, while I’m taking care of my kids at the same time, and I still have to balance a schedule like those of you who are working outside the home. Whether you’re at home during the day or you’re not, trying to fit everything in that we can is HARD. That’s why I wrote this post–to share what has worked for me, and has helped get me through the toughest times. My intent was to share this in the hopes that it could help someone else. I’ve had lots of questions and emails in the past about how I keep a clean house with all my kids, and this was in response to that–for those that are looking to try a new way or a new method to clean their house. 2 minute wipe down of bathrooms: Clorox wipes under the counter work great for this! Wipe off the counter and sink, and around the toilet as necessary. When I deep cleaned them on the weekend, it made it so much easier and faster. Put clean dishes away, put dirty ones in. Wipe off all counters. Quick vacuum over main floor or living area–family room, etc. Laundry!! Seriously. I wish there was a magic answer for it, but I haven’t found one yet. If you do, let me know! -whatever else I had time for! :) Usually one “extra job”, like the windowsills, windows, etc. I did find that if I could do those basic maintenance tasks during the week, it just didn’t take as long deep clean them on the weekend, which saved me time, and also meant more time with my family. I didn’t have to spend hours and hours–I could take 1 or 2 hours in the morning, then still have the rest of the day. I want to also emphasize that keeping a clean home is a FAMILY effort at our house. Yes, I do a lot of it, but my kids and husband all help–everyone is a part of the family, and need to take care of our home. Starting from a young age, my kids make their beds, clean up their toys, help put away the dishes, take out trashes, and learn to clean and wipe down bathrooms. They have an extra chore every day, and they are wiping down baseboards and cleaning light switches. It teaches them responsibility, how to clean, and what it takes to maintain a home. We are all in it together, especially when things are busy and crazy. Okay, so I know it can look overwhelming. But…just keep in mind that those tasks a MUCH shorter time to complete when you are just maintaining them, and not deep cleaning them. Clean your house top to bottom, then start the maintenance process, and you’ll see what a difference it makes, and how much time you can save!! I think I’m a little OCD too. :) Yes–you need a house!! Hope you find one soon!!! I think I would kill for an “OCD” husband haha. me too! I don’t have an OCD husband, but he is awesome at helping wherever he’s needed! He’s also good at putting up with me…and my “OCD” self. :) Thanks for stopping by!!! Woo woo! Love your energy. You are so right! Everyone is happier with clean! For sure…especially me! :) Thanks for dropping by!!! Thank you, I was looking for something that was going to help me with a cleaning schedule but wasn’t going to be overwhelming. I’m a little ADD, so having something to look and and keep up with during the day really helps! Thanks neighbor! So… Do you wash 7 beds worth of sheets every Friday then? Or split it up such as girls one week and boys the next? Same question with bed quilts. ;). Thank you for sharing this and going into details. My biggest problem for some reason is doing the mail every day. If I keep up with that and don’t let the paper clutter take over, life always seems to go so much smoother! I know–the mail can be a pain, and it’s not my favorite. But you’re right—stay on top of the paper clutter, and life is much easier!!! So I have 5 teenagers and weekend college student (she lieves on campus 2 hours away, and comes home once, maybe twice a month and breaks). Ive been trying to create a chart for the 5 children at home each week similar to this that includes the weeklu and even monthly items on there and color code it by child. I HAVE NOT been successful with it. I would like one in each room and a main one in the kitchen. I cant seem to figure it out. Any ideas? Okay, let me see if I have this straight: You want only one chart, but color coded for each child. When you saw one in each room and one in the kitchen, do you mean a copy of the same chart? Or a chart that’s just for the jobs in that room? I would like one that is the same in each room (for each child/each month) for the daily, weekly and monthly items that shows for each child what they are responsible for. That way they know each day, each week, what they are supposed to so there is no question. Right now each child has a set day M-F where they do all things Kitchen (make dinner, dishes, sweeping floors counters etc) and they have to do their laundry that day as well. It would be nice to have a weekend assigned maybe for sheets and bedding (they don’t do that as well). I have tried a weekly calendar/monthly calendar using a white board that would get messy and ugly. I just randomly assign the others to do the living rooms, bathrooms, walls/blinds, cabinets/reorganization, garage and storage room etc. There is not much organization to it and sometimes I forget some of them. I tried putting it on a spreadsheet and couldnt figure out how to get it right with each week and task and who was to do what. Obviously the mail and paper stuff would not be something they would do, so either leaving it out or replacing it with something else. Everytime I start to try a chart for the month that includes all the other stuff…..it gets too messy for me. Disclaimer: I am a single college student living with room mates so take this for what it’s worth. I have been a nanny/mother’s helper for about 5 years so I do know what running a household looks like. Random thought that popped into my head while reading your comment. Could you try the whiteboard but do it with permanent markers and then have magnets made with each child’s name? Maybe have it set up like a calendar so that you can have all of the weekly tasks split up by day and all the monthly tasks split up throughout each week? That way, the tasks stay the same day to day but you have the ability to move each child’s name around so they always know what they’re supposed to do. You could have them move their name before bed or you could move it for them so that when they wake up, all they have to do is look at the board to see what they need to get done on that day. This is a great idea, Amanda!! I love it! Thank you Amanda – sooo stealing this idea! Amanda…your parents should be so proud! I too am doing this! and Thank you Kierste for this schedule. I have just recently made the decision to become “temporarily retired” from the workforce, to spend much needed quality time with family. Goodbye cleaning ladies, hello me. YIKES! Am excited about doing everything myself but I can spend an hour on one drawer…so a house is beyond comprehension to me. Beginning this today and hoping I can stay on track! I now find myself helping to raise 2 grandchildren. Should I offer some small reward to them when they help without complaining. Otherwise they throw a fit and say Daddy doesn’t make us do that. I have talked with their Dad. Need any insight you might have. I would just start working it into your regular routine with them, so they know what they can expect when they’re at your house. You can talk to them about helping to take care of the house, and that they get to be a part of that. Explain what you expect from them, then it’s essential to be consistent, and stick to your guns–they’ll soon learn that you won’t back down, and they need to do it. Do a quick pick up before dinner or other meals—no eating until it’s done–they will most likely be more motivated do it quickly. :) You could do a small rewards program–“grandma” points for each time they do a job without complaint. I wouldn’t give them a prize every time, because then they’ll come to expect it, but come up with a certain amount of points, and then the kind of prize you want to give. Small things like a pack of crayons, stickers, a notebook, matchbox cars, and for a big prize (something they can work toward), maybe lunch out with you, or a trip to get ice cream. Make a simple sticker chart to track it–even just a piece of plain paper with their names written at the top–and tack it up where they can see it. A visual of their progress can really make a difference. Good luck!!! Teaching the children that working together as a family means they’re part of a ‘team’ and we need all players to work towards the chosen goal! I think I may have found THE schedule. I have been searching for one such as this for years! I believe it’s combination your awesomeness and my personal growth. Thank you my DIY fromend. Thank you. I think this plan is brilliant! I had a similar schedule until my baby was born with lots of health problems that completely derailed everything in life. I’m going to use your schedule to help get me back on track, though. A question I have is what chores do you have your kids do? Do they have daily chores or just Saturday chores? Hi Stacy! I’m so sorry to hear about your baby’s health problems. How is he/she now? My kids have regular, daily chores that they do even on Saturday. Some of those include making their beds, keeping their belongings picked up and put away, putting away the dishes, loading the dishwasher, setting the table, taking out the trash, and picking up the playroom. On Saturday they have an extra chore, like wiping down baseboards, dusting, picking weeds, etc. My oldest son is 15, and he does his own laundry, mows the lawn, cleans his bathroom, and is responsible for dusting and vacuuming his own room. It really depends on their age, and I add/change things they can do as they get older. How old are your kids? I can give you an idea of what my kids do at that age. I love the stay on top of everything idea. You however seem to be a stay at home mom. How would all these daily, weekly, and monthly tasks get done if my wife works a full time job? In our situation, we both work full time jobs and our job hours are very different. We have three children. One in junior high, one in elementary, and one in daycare. It seems like if my wife didn’t work outside the house full time your routine would work. What do you have to say to all those families with both parents working full time jobs outside the house in relationship to maintaining a clean house? Hi Jeff! I’m glad you asked! I am a stay-at-home mom, but I haven’t always been. I have had the experience of working and being a mom, so I can relate. The idea of maintenance was just as important to me then, because it really did save me time in the long run. I didn’t ever have the time to do long days of cleaning or laundry (I don’t now, either! ), so the idea of doing a little everyday was still applicable–the times of day just had to be shifted. It still works, it just has to be adapted for different schedules, and things have to be moved around to accommodate them. I didn’t have older kids when I worked, so I know that changes things (homework, running them to extracurricular activities, etc. ), but kids can also be a huge help in daily chores and responsibilities. My oldest son is 15, and he does his own laundry, which reduces the amount that I have to do, plus it teaches him an essential life skill. All of my children have daily chores and are responsible for certain things, which also helps keep the house in a more easily maintainable state. Kids can totally help–bathrooms, vacuuming, dusting, keeping their rooms clean, helping fold and put away laundry, etc. When I was working, I split the cleaning between the times I was home–a little in the morning, and a little at night. Saturdays had to have a few more things added to the list to balance it all out. For example, in the mornings I would make sure that all beds were made, put away and load dishes, wipe off counters from breakfast, and do a quick sweep. I would still do a 3 minute wipe down of the bathroom as soon as I finished getting ready. This was about a 20 minute routine that I could fit in before I left for work. That night after dinner, I would spend another 45 minutes or so cleaning–doing the other items on my list, plus a load or two of laundry. Taking a few minutes to go through the mail so I could reduce paper clutter always made a huge difference. Saturdays I would do things like wash sheets, and some of the other items on my list that were a little more time consuming. Keeping up the maintenance as best as I could during the week was at the crux of my success. Trying to clean and do everything on Saturday was just too much for me! I understand lives are busy, which is why I shared this schedule. In my experience, it’s been easier for me, both working in and out of the home, to do a little every day–to keep the house as clean as I could every single day–it has helped me maintain a cleaner house on a regular basis. It’s a basic guide that can be adapted and shifted based on personal circumstance and schedule, so that hopefully anyone can take it and use to help them do the same thing. Thanks so much for this! It also helps my ADHD brain focus a little more. Otherwise, I run from task to task without really finishing. It’s good for me if I can check something off, so thank you. I would like to add that men can help with this list as well. It doesn’t all need to fall on us women. Both my husband and I work and go to school full time. With 2 kids, our schedules are hectic. In one of my classes, I learned that even when both the man and woman work full time, the woman will still do most the house work. That does NOT need to be the case. Men can be responsible for part of the list they have time for or know how to do (which, hopefully, is everything) and women can be responsible for the other part and children have their tasks as well. Just a thought for those of us who stress out that we need a perfect home for our men and families without help. They help make the mess; they help clean it up! I really like your lists! I live in a large five bedroom home, with four special needs kiddos all under the age of 6. I homeschool. I’m a blogger and well… Life is crazy! It is nearly impossible to work my daily and weekly schedule (forget about monthly schedule), so that the house cleaning gets done. Week after week, month after month, that’s what seems to slide, that and taking care of myself. Lol. Your lists seem manageable though. I may give them a try. My husband has offered to help, the wonderful man that he is. I do have one question-what about those sick days, appointment days, shopping trip days, etc.? Do you always follow your lists or are there some weeks that you slack, just because you’re human. And if or when you do, how do you get yourself back into the cycle without feeling completely overwhelmed? I can’t tell you how thankful I am for this. I wasn’t taught great cleaning skills and I have struggled for years learning how to come up with a system. I am going to try this and see if it works for me. I really, really appreciate it. Thank you! My sister just told me about your blog and this post. We have decided to try it out this coming week or two to see how we like it. Thanks for putting so much work into it! This is a great idea…in theory. If i can squeeze in getting all the laundry waahed in one day I am lucky. We have seven kids, in a 800 square foot ish trailer. Goats to milk, barns to muck out, dogs to walk, bread to make, eggs to gather, laundry to take to the laundromat (we dont have a dryer, winter is awful fordrying clothes! ), if I had an extra two hours every day, my house would be spotless too. Cowboy boots are lined up next to the barn mud. Stuffed animals live in the strangest places in my house, but hey, that’s okay. we are happy. we utilize every inch of our little trailer, manage to make everything we eat from scratch, can every jar of food in the cupboard, spend every extra minute outdoors (unless its -20 like it has been). You’re right–we all lead different lives, with different routines–it’s all about finding what works for you! Thanks for dropping by! Oh, how I love this! One of my resolutions this year was to get a cleaning schedule going, and lo and behold one of my friends linked this post on FB, hooray! I’m hooked. I am excited to try it out, just need to tweak it to add a dog grooming session, we have a big dog that requires nail trimming and a good bath and blow dry weekly- which requires a bathroom deep clean immediately after to manage the resulting fur jungle. ;) Thanks for posting! 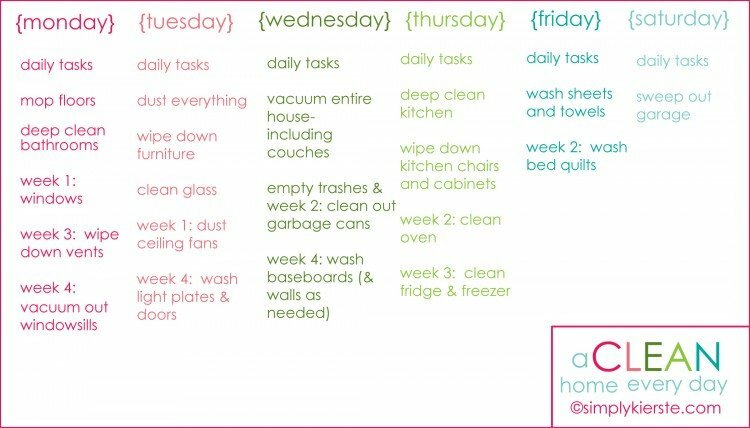 This cleaning schedule looks great and doable. Do you have a specific time that you do the grocery shopping and/or other errands? What about cooking dinner? It seems like you are really busy once your older kids get home from school. I don’t really have a set schedule. I’m in a tough position right now with little ones, because my twin boys (4) are in preschool twice a week, which would normally be a great time to run lots of errands/grocery shopping, but my baby takes her nap right at that same time, and it just doesn’t work. Sometimes I’ll take all three, but not for huge trips–just the weekly stuff that we might need at the store. For now, I do what I can during the day (things that have to be done, like the post office, etc. ), but I usually have to wait until my husband gets home from work, or on Saturdays. Once they’re a little older, or when my baby is taking only one nap a day (in the afternoon), I’ll take the mornings to get more done. When it comes to dinner, I try to prep what I can during the day. I love crockpot meals, and do those quite a bit. If I can do any prep, like chopping vegetables, thawing meat, etc., I’ll work on that before the kids get home from school. I try to take only 30 minutes of actual preparation time before dinner, which is about the max that I have with kids’ stuff going on. Loved seeing your list! Quick question though: what is the difference between dusting and wiping down the furniture with a damp cloth? Can you be more specific please because I don’t really understand the differece. Thanks! Great question! When I say dust, it’s all surfaces–lamps, lampshades, electronics, mantels, ledges, etc. I like to use a damp cloth to wipe down all of our bedroom furniture (and other furniture that can be wiped down), to clean it a little more than just dusting. Dusting gets rid of the dust, but not sticky fingerprints (my kids’ beds), or other things that can only be washed off! Ok, that totally makes sense now, thanks! What products/method do you like? I used to love disposable Swiffer dusters, but sometimes I notice now they push the dust around more than pick it up, at least on certain surfaces. And electronics? Ugh, they are dust magnets and seem to attract more as soon as I turn around. It feels like a losing battle! Yes—finding a good duster is hard, and I haven’t had much more luck than you have. Honestly, I end up using a damp lint-free cloth on most of my furniture, unless it’s something that needs polish, or can’t get wet (i.e. my piano). I even use it on my electronics, and it works like a charm. Old tee shirts work really well, and I use them all the time!!! Thank you so much for having this all in one place!! 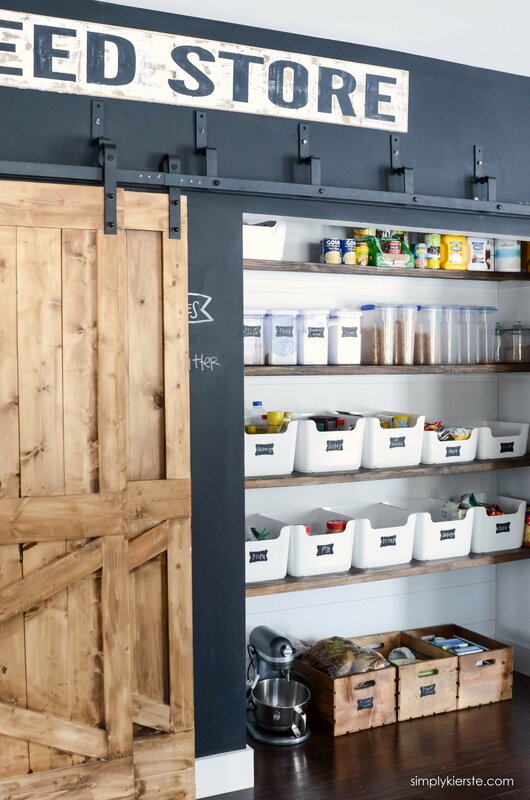 I’ve been trying to organize our home since my first child, and this is almost exactly what I’ve been thinking! I’ll have to tweak just a couple of things to be more our-family-specific, but I think you’re right on! Since I’ve had children, I really REALLY need our home to be a clean and welcoming environment — and the more children I had, the more I needed that calm in the storm. After the kids go to bed, I want to do fun projects that are just for me, and if I still have a huge list of things to be done (or housework staring me in the face! ), I just don’t feel like I can do ANYTHING. One more thing I have to mention — I was the first to get married on both sides, and since my mother was really cluttery, I feel like I’m fighting this fight with a little less info than I really need. If I had a big sister, I could watch her example, because all the girls in my family are totally on the other side of the clutter spectrum — we all crave the order of an uncluttered home. Thank you so much for helping me see that it’s possible (at least sometimes) — and for being the “big sister” I didn’t have! Any tips for a step mom who wants to keep things “fair” for her own children who are with us 7 days/week and 4 children who are with us 2-4 days a week depending on the week. This sounds great! But I have a small problem. I’m a single mom and work 60 miles from home so I leave at 5:30 in the morning and get home around 5:30 in the evening. Once I get home I feel like I’m in a mad rush to get dinner cooked, eaten, and cleaned up, and get homework done, showers, and the next days things put in a pile before bed. My house is 2200 sq ft and I have all hardwood floors so just floor cleaning is a big job. I literally feel like I have no time in the day to get anything done. What can you suggest for someone who has only about 3 hours per day during the week? I’m guessing push most of it to the weekend between parties and errands I can’t do during the week? -Every night put aside 30-35 minutes (if you can) and do the following: a quick wipe down of the bathrooms (literally 3 minutes each), sweep the kitchen floor and wipe off all of the counters(5-7 minutes), go through the mail/school papers (5-7 minutes), and do a quick house pick-up (10 minutes). Have your kids help! They can take certain rooms and make sure they’re picked up, including their own rooms. Put on some music, and do it as a family, and even see how fast you can get it done! My kids love races, so that’s always a great way to get them to move quickly and get motivated. If it’s mostly cleaned up at night, and you’re gone all during the day, the basic house pickup should go pretty quickly. If you have more than 30 minutes, add in one thing–like vacuuming a main area of the house, or a quick dusting. -I would also try to do one load of laundry on the days that it works for you. Throw it in as soon as you get home, and it can be washing and drying while you’re doing dinner, homework, and showers. Fold it right before bed–one load usually takes only about 10-15 minutes, and then if you have time you can put it away in the morning. I like to fold while I’m watching a favorite show or movie–then I feel like I’m still relaxing, but getting something done at the same time. -I love crockpot meals, and they save me on the days that I’m gone all day long. You probably don’t want to do it every day, but even three days a week would greatly reduce the amount of time you have to spend making dinner. -On the weekends you can hit the bigger stuff, like your floors. If I spot mop, and sweep every day, then I can mop pretty fast–about 10 minutes. Vacuuming always takes the same amount of time, but kids can help do this too! My kids love to vacuum, and they can be doing their rooms (if they’re old enough) while you’re mopping. While you’re doing the floors, throw in a load of sheets (I can fit 2 twin size sets in my washer), and then you can make the beds as soon as you’re done with the floors. If you can set aside the 30-35 minutes each day during the week, the weekend time will be reduced. 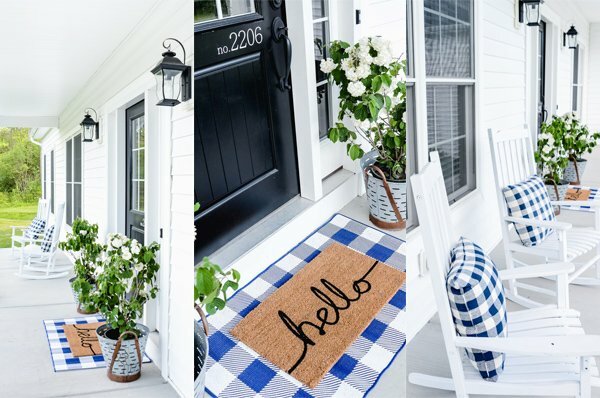 -On a Saturday that you’re mostly home, you can really hit it hard and do a few other things, like wiping down baseboards, light switches, and vents–anything else you need to catch up on. First of all, Thank you! :) I will try to do what you lined out and see if that works. Last night before bed although I was exhausted a did a quick pick up of all the rooms, put some dishes in the dishwasher, and started a load of laundry. This morning before I left the house I put the laundry in the dryer so i can fold and put away when I get home. My house is normally tidy but baseboards and windows (including blinds and curtains) are my nemesis. I think if I give just a few extra minutes to the wiping down and laundry during the week my weekend cleaning won’t be so bad. Thank you for helping with this amazing blog, which I just got introduced to yesterday. Thank you for sharing! I do this however stopped with the hustle and bustle of life. Now I have it in writing and will be assigning tasks to my 6 and 10 year old! This is very helpful, when do you find time to dejunk closets and house it seems like our house gets overrun with stuff we aren’t using. How do you “deep clean” bathroom and kitchen (drawers, stovetop, burners andmicrowave)? Great question! When I say “deep clean”, I’m just separating out the difference between a general wiping down every day. When I do a general clean ever day, it’s just wiping off exposed surfaces, like counters and sinks, and even cabinet faces. In the bathroom I’ll wipe down the toilet seat area too (I have two 4 year old boys plus two other boys, and it’s ALWAYS dirty, lol). When I deep clean the bathroom, it means scrubbing the shower/tub, mopping everywhere (especially on the sides and behind the toilet) and doing baseboards, wiping down all the cabinets and inside drawers if necessary, scrubbing the inside and outside of the toilet, mirrors, and counters. I also straighten anything that’s underneath a cabinet. Deep cleaning in the kitchen for me means scrubbing out the microwave, taking the burners off and cleaning them, plus underneath them, wiping out drawers, cleaning cabinet faces, and moving things off of the counters to clean behind them. I also wipe down all the kitchen chairs around my island, and any other surface. Thanks for this list! I put mine in a clear page protector and check out each item with a dry erase marker. It saves me from having to print a new sheet all the time. I love this lay-out! I’m so excited to try these cleaning charts. I have NEVER had a schedule and my house is always “behind” well ok messy… I will start off with what you have and modify as needed – THANK YOU – for sharing so I have some direction…… May The Force Be With Me! Love this cleaning schedule! On Mondays for week 1 you list windows. Just curious to know what you find works best for cleaning them and if you do inside and out? I hate doing windows as well so just trying to see how in depth I have to get! I’m glad!!! I created it in Photoshop, so I don’t have it in Word. :( I can send you the psd file if you have Photoshop and want to edit there. So sorry!! I basically have a lot of problems with deep cleaning. I can’t keep the surface cleaned because of wanting to clean out closets, etc. Then my house is always a mess. Do you suggest basically working on surface and keeping that done and then just working on one room at a time to declutter? I have never really had a system, but have always made a lot of lists. I think this system will work for me. I love these pages! Is there any way I could get the name of the fonts used? Thanks in advance! Love these tips and actually do many of these things already. I have a question for you though – I am due with baby number 5 in about 5 weeks. How did you keep this up while largely pregnant and once baby came? Were you able to keep up with it? I am not looking forward to my house falling apart during those first few weeks with a new baby. Great question, Sara. I was able to do everything on my list until the very end, except for some of the bigger, monthly tasks. My husband already helped, and he really stepped in to help even more with those. (especially things like sweeping the garage, etc.) Being in maintenance mode made it way easier to stay on top of things, even being huge and pregnant. My kids were already doing some of the things that would have been hard for me—things like leaning over to do baseboards, etc. I stopped mopping on my hands and knees, and used a mop (except the bathrooms). After the baby came, I got lucky. My parents came and stayed for a couple of weeks, and they helped keep my house together, along with my husband, who really did a great job. That’s been the case for all six of my kids. If I didn’t have my parents, I would have just done the very basics–wiping down bathrooms, keeping the kitchen clean and swept, mail put away. Have your husband vacuum for you. :) I’ve had c-sections, so couldn’t vacuum for several weeks, so my hubby was a saint, and took over for me. I found that just those main, basic things were enough to get me through a few weeks of downtime, because my foundation of clean was already there. Once I was back to my normal routine, it didn’t take long at all to get it back to where it was before. Perfect. Thank you for the suggestions! Love this!!! Thanks :) I’ve been blog stalking you lately…love your site!! Hi! Really like your cleaning schedule. I work three days a week so I am trying to figure out how to create my own schedule with your lists. I think I must be a slow cleaner because when I wipe down walls, doors, etc, or clean windows it literally takes me all day! Ugh! Was just wondering how you go about it and what you are using to clean with ex. Swifter adjusters, or we talking pinesol/rag up on a step stool? You’re not a slow cleaner! If I’m doing my walls and doors on a regular basis, and in maintenance mode, there isn’t as much dirt and grime, so it doesn’t take nearly as long. Don’t get me wrong, it’s not a small job, but it’s much faster when it’s scheduled regularly. Doors are the fastest, then the walls, then the windows–which are my least favorite. :) When I clean doors, I just use a good all-purpose cleaner and water. A good wipe-down, front and back usually takes a couple of minutes per door. Walls are similar—the same type of cleaner, but I’ve even used a mop on my walls. :) I use the Clorox mop that’s flat and wide, with a removable and washable cloth, and I get that west with water and cleaner, squeeze it out, and use it like I would a paint roller! If you have flat paint, I have a whole system for that, but usually I just touch up with paint, since you can’t wash it. If they look pretty good, I won’t clean the entire wall, just spots that need it, and that goes much faster. Windows (I’m talking about inside only) I use newspaper and vinegar/water solution, or Windex and a lint-free cloth. It will depend on how big your house is, and how dirty/clean it is to begin with. Sometimes it is a chore that takes me a little longer, but like I said before, once I’m in maintenance mode, I find that I can do it much more quickly. Hopefully this helps! let me know if you have any other questions. Thanks for the tips! Lol I think every time I do these chores I am thinking deep cleaning and not maintenance mode. Yes, kids can complain about chores, but having a schedule/chore chart does help with that–it sets an expectation, and they can clearly understand what needs to be done. I also attach it with a clear expectation of what happens if they don’t get them done, so there isn’t any question on either side. Sit them down, explain the chore chart, what’s expected, the consequences, and how you see it working. They can ask any questions they might have, and everyone can leave being on the same page. It will probably take some adjustment time for everyone to get used to it, but it will click in. I can’t promise that there will never be any complaining or that chores will always get done (I wish there was something for that, lol!!! ), but my experience has shown me that it does make a huge difference. I love it because it’s very simple to make and maintain, and easy to add or take away chores when you need to. You can give each child a jar with their own sticks, or one big jar–whatever works best for you. You can have one for the morning, and one for the night, or just put “am” and “pm” on the sticks. During the week, my kids are responsible for: cleaning their room, making their bed, homework, brush teeth, music lessons practice, and helping to pick up their “area” each night. My oldest son is also responsible for taking out the trash. My oldest three take turns being responsible for putting away the clean dishes each morning, and loading them after dinner at night. They also have an extra chore to help with, and that’s where things like vacuuming, dusting, cleaning the bathroom, washing down baseboards, etc. come into play. I have a stick that says “extra chore”, and they have to come to me to get their assignment. That way, I can have them do whatever needs to be done that day. If we maintain a clean house during the week, then we don’t have a ton to do on Saturday. I also expect them to clean up after themselves at all times–shoes put away, backpacks and coats hung up, etc. Sounds like you don’t have a job outside the home. How do you propose fitting this into a schedule when you’re only at home in the evenings and trying to keep up with kid schedules? Some nights I am only home for a couple of hours filled with homework and dinner before we all fall into bed to do it over the next day. I doubt my garage has EVER been swept out, let alone monthly… Good luck for the SAHM out there. Working moms who want think kind of cleaning schedule have to hire someone to do it for them or live with a cluttered house. Terra, thank you for your comment and question. I am a SAHM, I also work from home. So, I’m trying to fit in a job, plus take care of my kids, so while my circumstances are different, I do understand trying to juggle a lot. I’ve had many comments from working moms, and so I added an update at the bottom of my post. I have worked outside the home before, and I added what I did in case it helps. I realize that we all have different lives and families and circumstances and schedules, and things have to be adjusted accordingly. I know it’s HARD. I get it–all moms are just trying to do their best while juggling a million things. That’s why I wanted to share this in the first place–to help anyone that was looking for it. This has helped me through it all, and has kept me sane. It’s changed, been adjusted, things moved around and juggled, but the basic premise/method has stayed the same: when I do a little every day, as much as I can, and try to maintain cleanliness, it is SO much faster and easier for me to keep things clean. I also get the benefit of a cleaner house along the way. Sometimes it’s been more, and others times it’s been less, but the basics have remained the same. This exact schedule may not be something that works for everyone, or that everyone wants to do, and that’s so okay! We are all just trying to do the best we can, and find something that works for us. Good luck to you, and thanks for stopping by!!! Thanks for sharing, Kierste! My partner, William, works from home and his teenage son is with us part time. I am a graduate student and I “work” from home too. WOW things can get messy fast!! I think the key to your success is that your kids have jobs early on and they pitch in. I think that’s great. You also have rules about no dishes in the sink and other “guidelines” that make it helpful for people to keep things neat rather than make things neat. (I wish we had that. I tried, oh yes I have!) I think it’s great that you are sharing what works for you. Anyone who reads it will understand that it’s personal guidelines that they can tweak to suit their needs and life. I downloaded your charts a long time ago and tweaked them for myself when I was single and living alone. Now that my life has changed I’ll tweak it again and print it out for us. Thank you again for sharing!! I’m on board with much of this cleaning routine and think that it is very doable. However, cleaning walls is a pretty big task. You really wash all the walls monthly? I don’t know how you work that in. I don’t wash every single wall every month–I just go around and check them out, and wash the ones that do. Usually it’s right around the dining room table, outside bathrooms and bedrooms, and the entries. I don’t always have to do the entire wall–just the area that shows dirt or smudges. Sometimes I’ll just do them when I see them, when I’m cleaning the bathroom, and if I can stay on top of it, it doesn’t take too long! *laundry solution* I am a single mom of six, and I was completely overwhelmed with laundry, and chores, etc. We all get together and each person fools their own laundry, and pairs and fills their socks, otherwise, I’m hours and hours into laundry alone. I have organized their starts for each of them so there is room and organization for them to put it away. (Note: the little kids need some help, but it is a fun way to talk about the day, bond, and come together as a team and conquer a task that can be overwhelming– and even if it takes just as long as if I do it alone it’s still an amazing opportunity to spend with my kids.) From there, they take their folded laundry, and put it away. Each has their own little baskets to bring laundry to the laundry room, and then transport their folded laundry. Love the detail but am having to rewrite the list as I would want to have the list in columns day week month. With everything in keeping with the daily list how I would like it. That way I can get all the stuff done that is in the kitchen at the same time instead of coming back to it for the weekly or monthly items. Hard to explain but seemed the daily chores were not in the same order when it came to weekly or monthly duties. One thing about cleaning is if you have things to do in that room, do it while your there. Thanks for the list. Hola puedes colocar este archivo en español. Me interesa el listado de tareas diarias. Semanales y mensuales. Es grandioso. Saludos y gracias. Hola! Voy a ver si hay alguien que puede traducir por mí, y yo estaría feliz de compartir . Déjame ver qué puedo hacer. Gracias! I totally get it! Give it a try–it really is so much easier to do a little bit everyday, instead of trying to clean huge amounts at one time. Even if you need to modify this list for you, that’s okay–just do as many of the basics as you can everyday, and it will help!! You can do it!! En verdad gracias por el esfuerzo de compartir sus archivos en español. Los estaré esperando. Saludos y gracias. 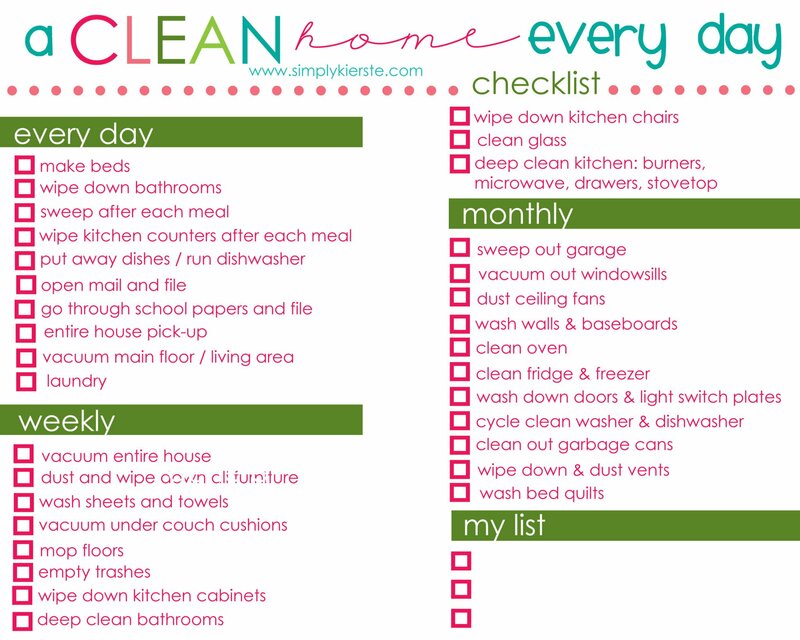 What does your chore schedule look like for your kids and how often do they have chores to do? I am a mother of 2 (ages 3 and 5) and I do okay with staying on top of them with cleaning up their messes, but it is like pulling teeth every time. So I was just wondering what works for you (for those ages) and how you go about it. It literally takes them less than 5 minutes or less, which is good for those ages. They’re motivated by the activity they want to do, and it has worked for me with all of my kids so far! When they’re 3, I’m helping (more like guiding) with everything, but my boys are 5, and they know how to pick up and can understand. I give them a 15-20 minute warning (i.e. “you have 15 minutes until lunch, start cleaning up!”, so they have plenty of time to get it done. I’m really consistent with it, and they have learned that’s what the expectation is. I still will get some arguments sometimes (they’re kids!! ), but for the most part, they just get it done so they can either eat or play. Since we’re doing it a couple of times a day, it’s not a huge mess, and it really doesn’t take them that long. Hope this helps! If you have any more questions, please let me know! Thank you so much. I have actually been following your plan (with just a little customizing to suit our schedule) and it has been helping immensely! It’s so nice to have a clean house all the time and not spend all day making it happen. I look forward to that post you were talking about. Thanks again! Thanks a million for this great list. I am quite possibly the worlds worst cleaner and the messier my house gets the lazier I get … the thought of tackling such a huge job just puts me right off getting up doing it!! My husband is away at work 3 weeks at a time so it’s just me with my 3 kids most of the time. Trying to fit in school activities as well as after school activities and homework can just overwhelm me some days so I am really going to give this a go. If I can just keep the house organised then everything else will just flow on that much easier. Thanks again .. here’s to a smooth flowing 2015!! I can absolutely relate. My husband has always worked long hours and traveled a lot, so I’ve been mostly on my own as well. It may sound funny, but this plan actually helps you the busier you are, because you’re only doing a little everyday. I know that it’s helped me immensely over the years. You can totally do this–if you need to modify it for your own schedule, that’s great–it’s really just the principle theory that counts. Love these suggestions! I HATE to clean, and our house has shown it over the past years. I started over Christmas break with your idea of wiping down the bath after getting ready. I have Clorox wipes and glass wipes under the sink now and do a quick-clean on the days my husband walks the dog in the morning (every other day). What a difference it makes! Next thing to tackle is daily (or, more realistically several times weekly) maintenance of the floors. We don’t have kids, but with a dog and a cat, the dust and pet hair builds up quickly. It’s still a work in progress, but starting to build in these habits of maintenance cleaning is making a BIG difference. And having clean areas of the house is infectious – it makes those dusty and neglected areas even more obvious and less acceptable. It’s even spilled over into my work life. Right now, my classroom is the cleanest and most organized that it’s ever been. I absolutely love these lists! I can’t wait to make my command center. I really like the look of your older list that has the yellow dots in the background. Do you happen to have the link to that printable still. It won’t let us click on it anymore. I wish I had a dishwasher to make my life easier. Most of my daily battle is keeping up with the dishes. I have to do them by hand in the sink, as we cannot have a dishwasher in our apartment… so that’s an additional hour everyday right there! Also, laundry has to be saved up throughout the week since we have to go to a laundromat to wash… but all in all, thanks for this post… there are a few tips that will help once I can implement them with my 15 month old at home. WOW! It’s the ultimate schedule and the best checklist I’ve seen. A friend of mine made a schedule and a cleaning plan for me, but most of the activities were arranged according to her cleaning habits and it’s not the best for me. I was thinking of my own plan, bun it doesn’t work good enough. Thank you for sharing you schedule and thank you for all the tips and the advices you give. Greets! BTW, 6 kids!?!?! I had my second girl (4 years and 7 days apart) then promptly gave my hubby the thumbs up for that vasectomy! I just subscribed and I look forward to learning more! I love this, Kierste! Thank you so much for sharing your ideas and creative design work with the rest of us! :o) Super cute & super helpful! I have just recently started staying at home to be with my family more. I had a cleaning lady when I was working but now it’s ME. I don’t have a cluttered or dirty home just a large 4,000sqft home. I was looking in here thinking ok now where to start. Your list is such a lifesaver. Last week was my first week at staying at home, It took me all day everyday to get things done because I didn’t have a plan. The good thing with your list is now I can start fresh with the daily and weekly chores and be right on track. Now if you could work miracles with the meal planning for picky eaters, that would be heaven. Thank you so much for sharing what works for you. Amazing list! Cleaning regularly guarantees you healthy life. My husband told me that it is really easy to clean one house. I am going to send him your article to show him exactly how many things need cleaning. Thank you for sharing it! Greetings! Fantastic list! I will move some tasks from monthly to weekly. I am going to print it immediately. Best regards! Thank you so much for the inspiration and the printables! Hi Kierste! This is wonderful; thanks for sharing! I just have oen question. I’ve wanted to adapt to a daily schedule for a while, rather than doing a big deep clean 1x per week, but I haven’t been able to picture how I’d dust without vacuuming right after, or mop without vacuuming right beforehand. How do you divvy those out over different days? Any tricks for not getting dust on the floor, or keeping tiles clean enough to mop without vacuuming/sweeping first? Thank you! Hi, Taylor! I realize I’m WAAAAY late answering your question, so I’m not sure if it’s even something you’re still wanting to know. But if so, I’ll leave it here just in case. I always sweep and mop on the same day, and vacuum and dust on the same day! But honestly, I sweep several times a day regularly (after each meal), so fitting in the mopping isn’t hard. I don’t use a vacuum on my wood floors, only a broom. So basically—hard floors one day (sweep and mop) and vacuum (carpet) and dusting on another day. HI! Thank you so much for making your cleaning list available to other busy mommas! I was looking for the cleaning list from your first post on this subject (the one with the yellow background). Do you still have that one available? It says “file not found” when I click it from the original post. Thanks so much! What advise can you give if you live alone? I have a clean house but would like a list to follow! Thank you so much! Hi, Patty! Honestly, I would follow the same list if I lived alone–I did when it was just the two of us as well. Even if there are rooms you don’t use as often, you’ll still want to do the floors and dusting on a regular basis. Extra bathrooms (perhaps a guest bath? ), even if not used much, will still get dirty and dusty from just sitting.